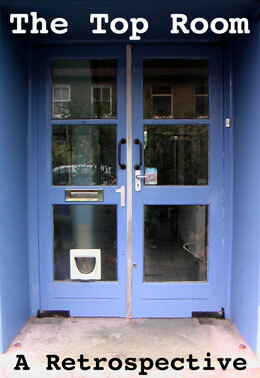 The Top Room:a small, independent space in East Dulwich that housed a number of idiosyncratic, sporadic and diverse projects under the directorship of artist Jeremy Glogan. Between 1997 and 2001 this small open-plan space that makes up the second floor of a house was the centre of some intriguing activity. It functioned as a place to show art to an audience, but was just as importantly a place that allowed artists to explore and investigate the boundaries of their practice. The Top Room was more than a space to show new work, providing a valuable site of collaboration and the generative exchange of ideas. Over twenty five artists participated in shows at The Top Room, including Nils Norman, Renee Greene, Johnny Spencer and Merlin Carpenter. Writer and lecturer Dan Smith has worked with Glogan to compile an arrangement of works and material previously shown at The Top Room, to engage in the history of the space, and configure a fresh set of encounters between the work and a new audience. This is not only to recognise the ongoing value of The Top Room, but also spaces like it: small scale projects that are run on the passion and commitment of those who invest their time, energy and resources. The exhibition at Chelsea Space also includes a new Top Room project in collaboration with Mel Bochner. In the archival spirit of a collection of works brought together by their history of showing in the space, Bochner's 'To Count: Transitive' will be remade and shown for the first time since 1973. In addition to the exhibition of works in The Chelsea Space, Glogan and Smith propose to produce a small publication of ephemera and documents relating to The Top Room, and to organise a panel discussion on the work of some of the artists and their relationship to The Top Room, as well as the past and present condition of alternative forms of art spaces.